Haematuria is the presence of blood in urine. Any visible or microscopic blood in the urine needs to be investigated by a urologist. The term “haematuria” refers to the presence of red blood cells in the urine. Haematuria should be defined as either “macroscopic” (visible) or “microscopic” (detected by chemical strip testing or microscope). Microscopic haematuria occurs in 2-5% of people in most community-based studies. It is normal to lose red blood cells in the urine, but generally this is not enough to show up in the common tests. There is no accepted “normal” amount of red blood cells in the urine, but the often-quoted limit is up to 10 million red cells per litre. Red urine does not necessarily mean blood in the urine. Beetroot and blackberries can discolour the urine red due to their pigment (anthrocyanin), as can various medications including phenothiazines. Haemoglobinuria and myoglobinuria (filtered breakdown products of blood and muscle) will also discolour the urine red. i.e. throughout the entire stream. Initial haematuria generally indicates bleeding from the urethra that is flushed out by the first passage of urine through the urethra. Terminal haematuria can arise from the prostate, bladder neck or trigone (base of the bladder) and is noticed at the end of urination when the bladder compresses these areas. Total haematuria indicates that the bleeding occurs at the level of the bladder or higher in the urinary tract, so that all of the urine is mixed with the blood, and the entire stream is therefore bloody. Pain that occurs in association with a urinary tract infection or passage of a stone may indicate that the bleeding is from a benign cause. 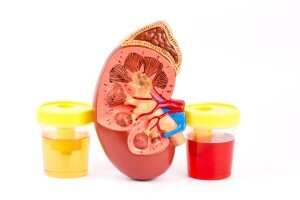 Painless haematuria is generally regarded as secondary to a urinary tract cancer, until proven otherwise. However, all bleeding warrants investigation, to be certain that there is not an associated cancer, besides the more obvious causes for painful bleeding. If blood is detected on a reagent strip, a microscopic analysis of the urine is required. Further microscopy of the urine may reveal white cells in the urine, which may indicate urinary infection. In addition, urine should be sent for urine culture. Urine cytology involves microscopic examination of the urine, to detect any abnormal or cancerous cells. The lining of the urinary tract continually sheds cells. If a cancer is present, particularly an aggressive one or carcinoma in situ of the bladder, these cells may be detectable in the specific urine cytology examination. Urine cytology is not very sensitive in detecting “well- differentiated” (less aggressive) tumours, as the cells in these tumours vary very little from the normal lining cells of the urinary tract, but is reasonably sensitive at detecting poorly differentiated (aggressive) tumours. In adults approximately 20% of patients who have macroscopic haematuria have an underlying urinary tract cancer, whereas only about 2-3% of patients with microscopic haematuria have an underlying malignancy. Macroscopic haematuria often causes considerable concern, and just a few drops of blood can turn a whole bladder full of urine quite dark red. Rare Inflammatory Lesions in the urinary tract, including TB, radiation treatment, & interstitial cystitis. Following a careful history and physical examination, a kidney dye test called an CT/IVU or IVP is performed. This involves an injection of IV contrast, which is excreted by the kidneys into the ureters (tubes) draining into the bladder. The CT/IVU is very sensitive at detecting causes of bleeding. An addition to this is an Ultrasound which is also sensitive at detecting causes of bleeding from the kidney, but does not clearly show the ureters and therefore can miss lesions in the ureter (apart from stones, causes of bleeding in the ureter are very rare). A combination of an ultrasound and CT/IVU is generally recommended. The radiological investigations above are very sensitive at detecting causes of bleeding in the upper renal tract, but can miss causes in the bladder. Small bladder tumours may be missed, so in addition a cystoscopy is usually also necessary. A cystoscopy involves inserting a telescope through the urethra tube into the bladder. This can be done with local anaesthetic lubricant jelly in the urethra, or with a general anaesthetic. The modern flexible telescopes are very small, and this procedure can be done with installation of local anaesthetic jelly in the urethra with very little discomfort and as a minor office procedure. If an abnormality is detected in the bladder that requires biopsy or removal, a general anaesthetic will be required to help remove the lesion and biopsy the region for laboratory testing. Thanks to Dr Michael Mackey, Urologist in Auckland, New Zealand for permission to use the above.